There is an understandable temptation to overlook highly efficient data centers when searching for energy savings. Maybe you’ve gotten your PUE down to 1.2 so why not just focus all your efforts on facilities that are performing poorly? That may be the case, but I continue to find examples of highly efficient data centers presenting the lowest hanging fruit. New, high efficiency data centers can often be the most fun and satisfying projects because the hard work has already been handled. They already have VFDs, modern controls systems, economizers and other hardware that allow for efficient operation, but there is ALWAYS more work to do. Often, it’s just a matter of optimizing the existing control sequences, which can lead to significant, low-cost savings. Q: Where do I look when I’m working to optimize a data center that already has efficient equipment? A: Anywhere that the systems may be doing more work than they need to. Maybe the chilled water is over-cooled, or the pumps are operating at a higher pressure than necessary, or the fans aren’t working together in an efficient way. It’s different for every data center, and it’s very important to consider the specifics of the facility before implementing controls measures. If the pumps have VFDs, make sure the minimum speed setpoint is no higher than necessary to meet the minimum requirements for wetting the tower fill. Consider cooling tower nozzle replacement to allow for reduced flow if the towers are oversized. Experimentation or modeling may be required to determine when to stage on a new tower. If the minimum flow requirements are high, or the condenser water pumps don’t have VFDs, it may make sense to ramp up the cooling tower fan to a fairly high speed before staging on a second tower. When multiple towers are operating, it is important that all tower fans operate at the same speed. It is common for one fan to ramp up to high speed before the next fan stages on, but this results in significantly higher energy than operating multiple fans at low speed. Another example can be found with Uninterruptable Power Supply (UPS) operation modes. It’s increasingly common to find UPSs equipped with eco-mode. This setting allows power to bypass the battery when power conditions are normal, reducing efficiency losses. If an irregularity in power is detected, the switch is thrown fast enough that it does not adversely impact the IT load. 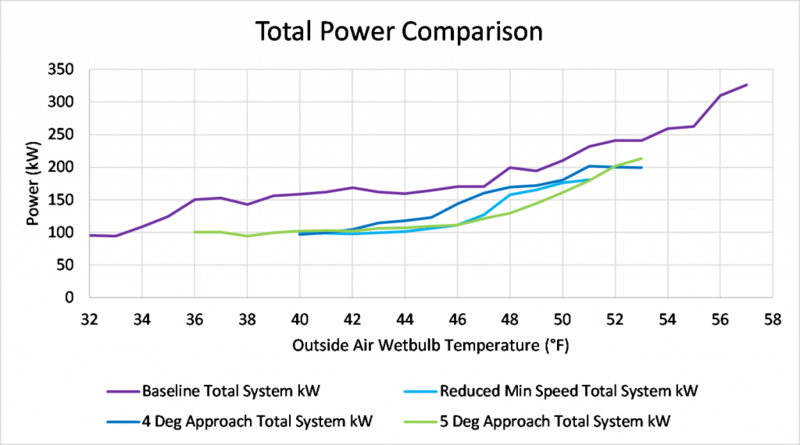 Not all eco-modes are created equal, proper precautions should be taken, and it’s not appropriate for all facilities, but this can be a very easy way to improve your PUE by a few percent. I’ve had customers who though they had it in place when it wasn’t and others who just didn’t know it was an option they had. 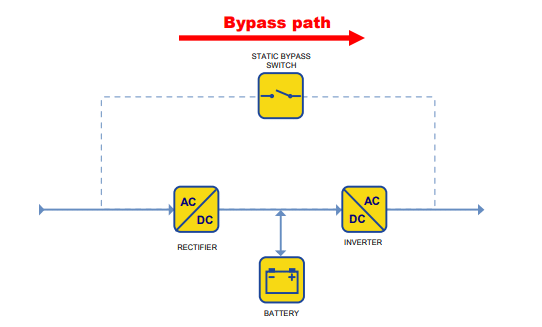 The figure below shows a simplified diagram of how the bypass works. So you just finished your beautiful new data center last year. It has top-of-the-line chillers, water-side economizer, CRAHs with plug fans and a variety of other wonderful things. You also had all the systems thoroughly commissioned by a third party after it was built. Fantastic, that’s all great stuff. It’s also time for an audit. Why? Chances are, the IT load was much smaller when it was commissioned, so it’s time to reassess the condenser water reset you’re using. The facility has also experienced a range of weather, so some systems may not be operating as expected. This is likely a very good opportunity for some fast, easy and inexpensive measures to dial in efficiency of the data center. One great example of this is Lawrence Berkeley National Lab’s NERSC data center. It was designed to operate at a PUE of 1.1 and it was operating at 1.1 when we began. That may sound daunting, but don’t be daunted! As a 6 MW data center, that still leaves 600 kW of non-IT load to work with, and in this case even the IT load was an opportunity. We’ve managed to verify annual savings of about 2 million kWh so far, through a variety of measures. One ongoing task has been to optimize how the different components of the cooling water plant interact. There are no chillers, so they just have cooling towers, pumps circulating water through the towers and pumps circulating water through the facility. The tower fans and all pumps had VFDs and power meters. Our goal was to minimize the combined pump and tower fan energy for all weather conditions. The first step we took was to implement and optimize a cooling tower water supply temperature reset, monitoring the total system power consumption over all weather conditions. Given the complexity of the system and interactive effects, we found it both more efficient and accurate to simply implement the changes and measure the effects instead of getting caught up with modeling the system. If a change resulted in higher energy consumption, we could simply change back. The graph below shows how total system power changed as we progressed through some of the steps, with the optimal operation shown by the green line. After our first pass on the cooling water plant, we are now digging into the super computers themselves. As we develop more controls capabilities, we will need to re-optimize the combined cooling water plant while also accounting for computer fan energy. I expect all of this to sound fairly complicated, because it is. The important take-away is that we had a lot of variables to consider, and that’s not uncommon for a high-performance data center. It’s worth the effort to investigate and optimize to make the most of what you have. It will take some time to analyze, but it can be very easy to implement the changes. Don’t be dissuaded to pursue opportunities at high efficiency data centers! These facilities are often the ones with the best opportunities for relatively easy, inexpensive measures. If you need any help saving energy at your data center contact us anytime. The lines in this figure represent average kW for 1 degree wet bulb bins. This simplified view helps to show the net change between measures.